A Wilderness Wedding, Formal Retreat or Large Family Gathering – we have everything you need at an unrivalled level of bespoke indulgence. The Big Husky Lodge boasts enviable space both inside and outside to create the perfect harmony for any gathering, family reunion, celebration or intimate wedding. Big Husky Luxury Mountain Lodge aims to give you an unforgettable bespoke wedding experience. It’s your special day, your vision, your wedding. Within reason, we’re probably the most accommodating venue in Scotland. We work with local Scottish Highland talent, who are great at bringing things together for your big day. Big Husky’s Highland location makes it easily accessible from Aberdeen, Dundee, Perth, Edinburgh and Glasgow, and set within a beautiful rural estate, provides the seclusion of the countryside, with the luxury of a grand period property. Big Husky lends itself to ceremonies with stunning views, spacious internal rooms, and glorious surroundings, let us help you arrange the most magical wedding day within Scotland’s finest mountain estates. Big Husky Lodge creates the perfect setting for a family gathering like no other. 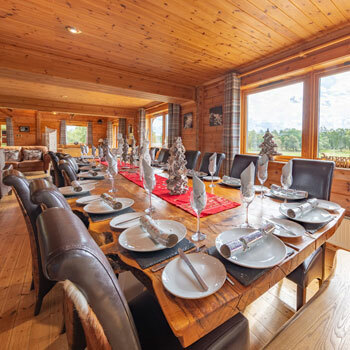 Not only is the lodge itself able to accommodate large numbers, but the garden area too is large enough to entice you into a Highland World, overlooked by the Cairngorm Mountains. A family reunion, or a special birthday celebration, where you need not worry about space for family members young and…more mature, the gated garden area is safe and secure to allow the celebrations to flow from inside the luxury lodge, outside into the large garden. A family gathering where you can lavish in luxury. Of course where there is corporate entertainment there is often food and drink. But what if a celebration of the world-envied, premium food and drink of the Scottish Highlands was at the very heart of your next corporate event? Whether you want to thank customers, reward staff, impress prospective clients or have mouthfuls of corporate team building fun via our competitive tasting elements, we are the specialists that can help you reach your objectives. Whether you choose an away day tour or a tasting event in the office or at another venue this is a corporate, sociable and sensory experience like no other. After all food and drink is the only art form to touch all the senses. We look forward to entertaining you. A Wilderness Wedding, or a Formal Retreat – we have everything you need at an unrivalled level of bespoke indulgence. Our Private Events Co-Ordinator has vast experience in wedding and corporate events. The luxury lodge itself is fully equipped to meet the needs of a large party of guests in terms of its size, features and tailored offerings, catering for up to 75 guests. Our private event coordinator is on hand to work with you to ensure your big day is an intimate and unrivalled experience that you will never want to forget. From wedding cars to bespoke catering. We will take care of all the little (and big) things that go with your day – just let us know if you require anything out of the ordinary and we’ll make the arrangements. Big Husky Lodge endeavours to ensure that every aspect of your stay is as you dreamed it to be – and more. With this in mind, our own private events co-ordinator will be on hand to manage your special day from flowers, beauticians and cars for your wedding, to adrenalin filled days for your corporate event. 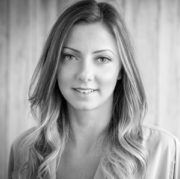 Professional and approachable, Claire brings over 15 years of experience in delighting clients and understands just how important it is that each group of guests experiences are not just great – but unforgettable! From breakfast hampers to arranging wedding ceremonies we thrive on going the extra mile.